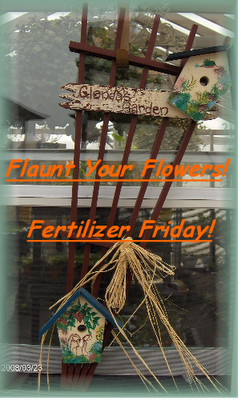 Welcome to the first October edition of Fertilizer Friday! For me this means getting to share the last of the blooms in my garden. I live in a zone 3 area and for the last two nights we have had what is known as a killing frost. This means that almost all of my gardens are completely wiped out! For the rest of the lucky gardeners that do not have frost or long cold winters, and who are able to simply re-plant for the fall/winter season....get out and feed your flowers...and don't forget those houseplants!!! Since I have only a few things to share...and this will more than likely end due to the frost falling heavy here, Fertilizer Friday will take a different approach for me over the winter months. Anyone who has a warm climate, and can still garden, keep things the same way as you have all season long...feed-post-link up and flaunt. For those who live in a cold area (like mine) you can share favorite garden shots from your growing season, or houseplants...or photos that inspire you for the next spring planting! So? What are we waiting for? Lets Flaunt our flowers and Tour the rest! My Mums still look okay...a little ragged from the recent high winds...but still vibrant in bloom. The front yard side bed was lucky to be under the window...so it is not frost killed as bad...but the wind did not spare this area and many of the Malva have fallen onto each other. Pretty Pink Geranium...saved by the overhang on the window. My Hydrangea seems to have gotten a miracle! No real frost damage yet. I wish I could make summer last longer here...these are so pretty when they mature! That's it for me. I plan to share the frost damage ...it's not pretty here at all anymore. Fall in Alberta is a challenge for gardeners who love their annuals! Please accept this invite to link in and share your blooms and houseplants with us! To those that link in THANK YOU! To all who commented and send prayers for our blogging friend Jill....I would like to say thank you and relay a message from her. She is currently safe for now, and she is overwhelmed by the amount of love and support she has received from all of us here in the land of blogging! Keep up the good work friends!